Early advertisement for the Chief and Super Chief-El Capitan. 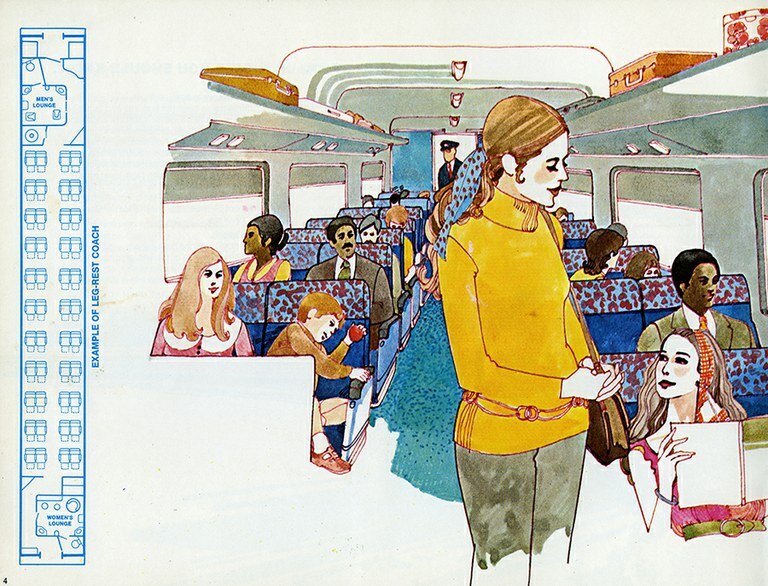 As Amtrak took over operation of the majority of the nation’s intercity passenger rail services in 1971, the company faced the challenge of educating the traveling public about its trains, accommodations and destinations. 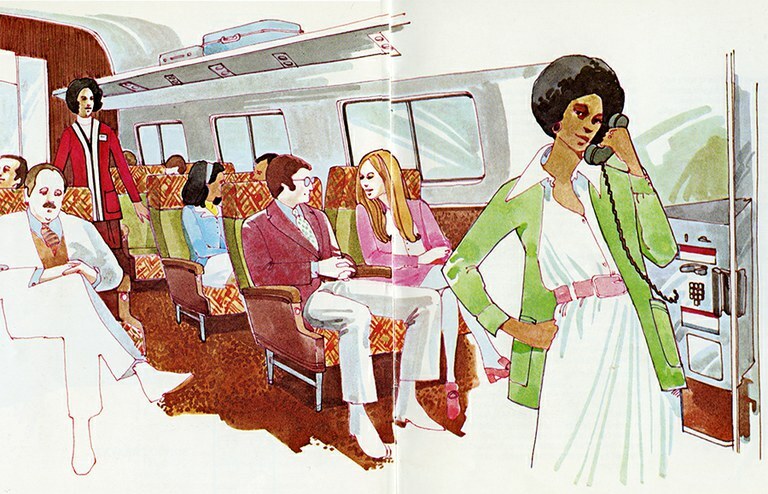 There had never been a truly national passenger rail service, and Americans naturally had many questions about routes and equipment. Updating the existing fleet of passenger cars and locomotives was one of Amtrak’s biggest challenges. 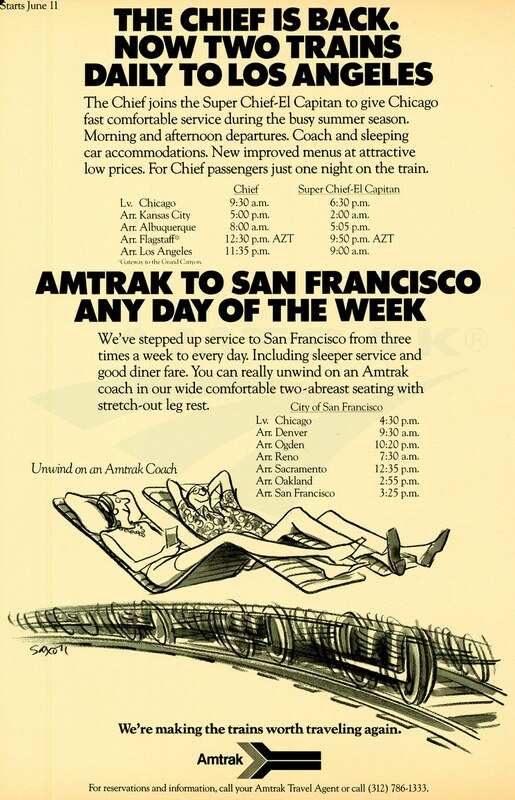 Prior to the start of operations on May 1, 1971, Amtrak handpicked approximately 1,200 cars from a total pool of 3,000 held by the two dozen private railroads that had been relieved of their passenger service obligations. Amtrak used a variety of means to tell the public about what it was doing to improve rail service—including placing advertisements in major newspapers, distributing pamphlets and conducting interviews with local media outlets. 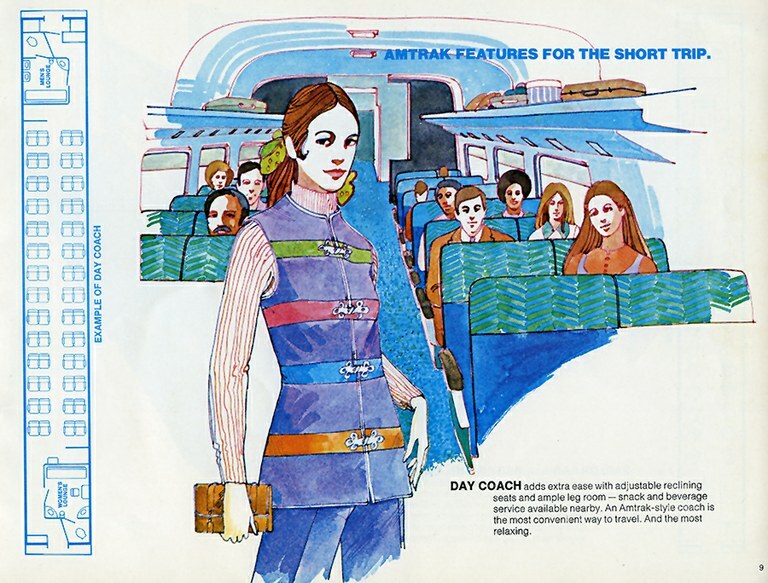 In 1972, Amtrak launched a national public relations tour as its first anniversary neared. Passenger service representatives such as Tricia “Patti” Saunders, along with employees from public relations firm Harshe-Rotman & Druck, Inc., visited more than 60 cities in six months. During interviews, they mentioned the company’s improved on-time performance, local enhancements to passenger rail service, an ongoing car refurbishment program, new Amtrak vacation packages and the launch of a computerized ticketing and reservation system. Enjoy these selected images or check out the full booklet for all the details! 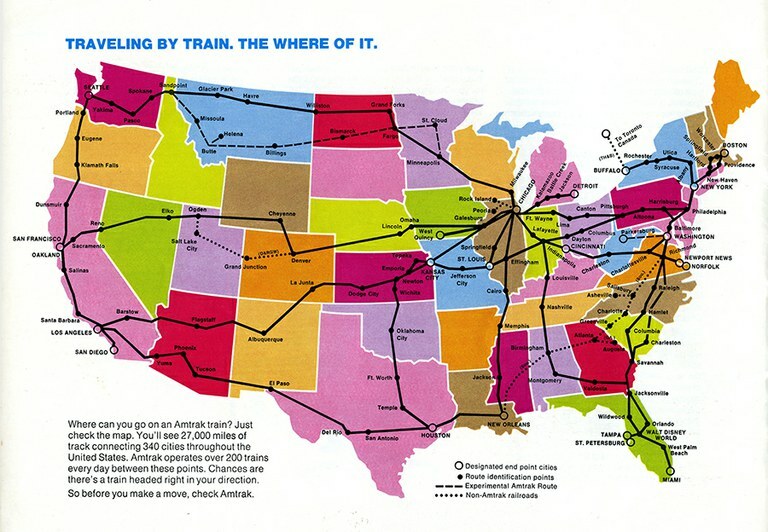 The description on the route map at the back of the booklet noted that Amtrak then connected 340 cities and operated over 200 trains a day. As of 2015, Amtrak serves more than 500 communities in 46 states, the District of Columbia and three Canadian provinces. It does so through more than 300 daily trains. Day Coach: "Adds extra ease with adjustable reclining seats and ample leg room - snack and beverage service available nearby." Leg-Rest Coach: "Offers deep-cushioned reclining seats with head-rests and adjustable leg rests - generally available for long-distance overnight travel." Metroliner: "Offers ultra-modern service - spacious seats in Metrocoach with food service available in Metro Snack-Bar Coach." 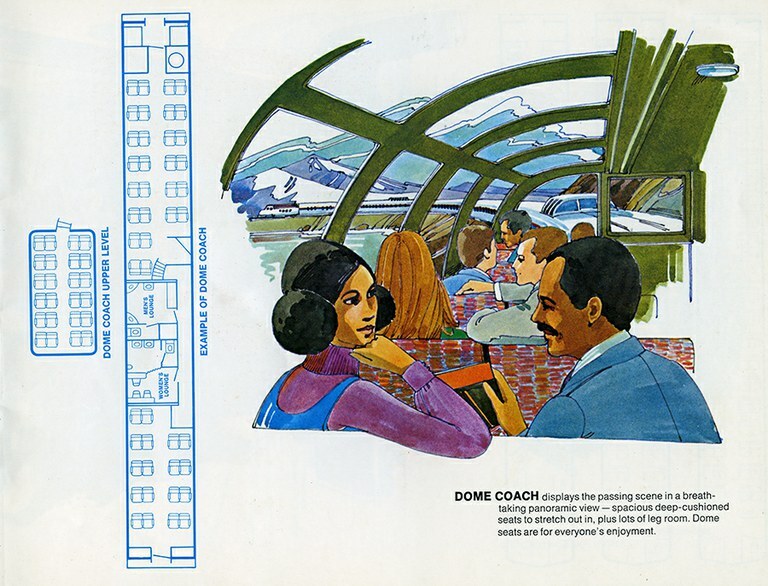 Dome Coach: "Displays the passing scene in breathtaking panoramic view." 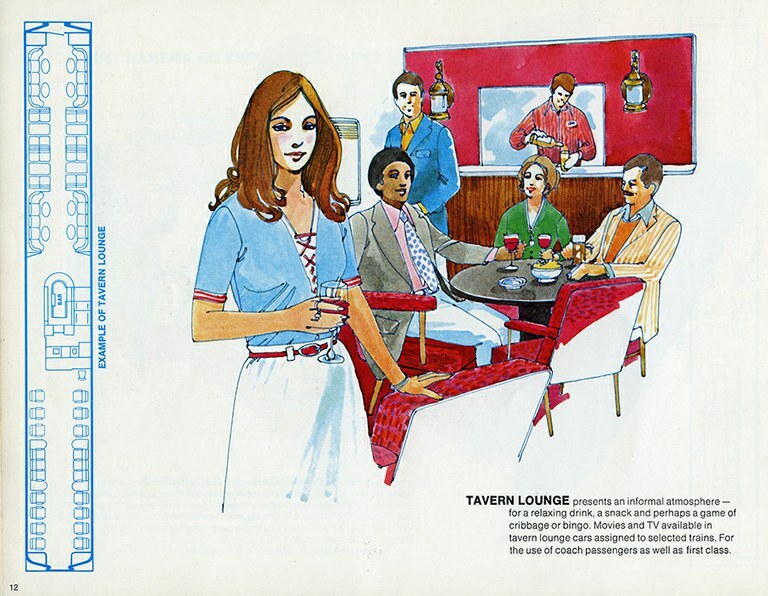 Tavern Lounge: "Presents an informal atmosphere - for a relaxing drink, a snack and perhaps a game of cribbage or bingo." 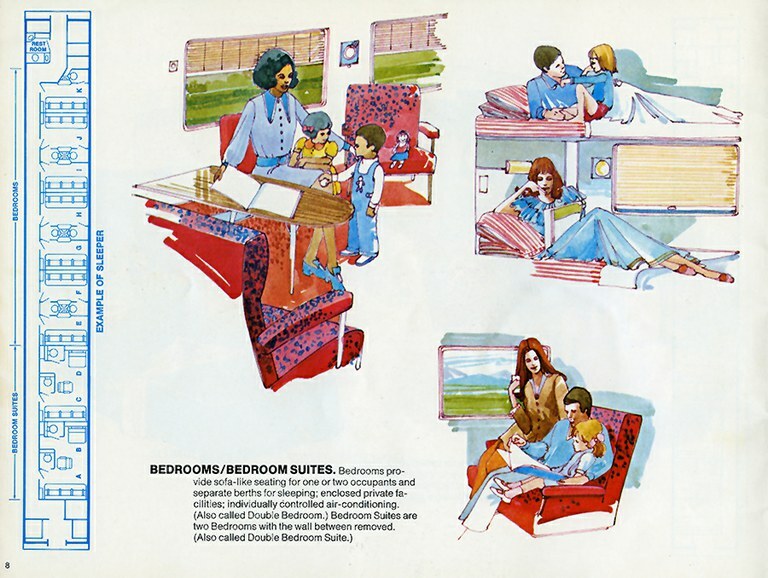 Bedrooms/Bedroom Suites: "Provide sofa-like seating for one or two occupants and separate berths for sleeping; enclosed private facilities; individually controlled air-conditioning."